Hove to off Swan Point – Page 44 – and sailing as slow as I can…. Figured out how to create seperate pages to house photos and other content. First one is for Beaton’s. Click on that name under the Page header on the right. More to follow…. One of the Beaton Irregulars launched his 1956 Pacemaker Spearfish today after a 3 week refit. 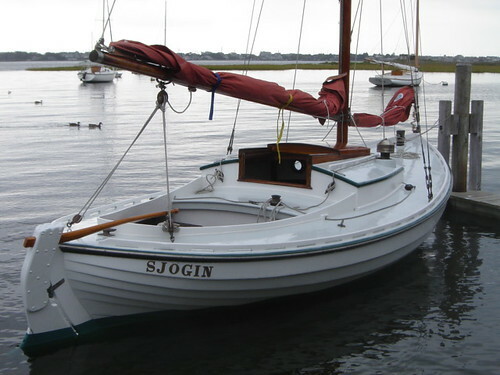 She will be kept in a covered shed in the water up at Johnson Bros. in Bay Head. 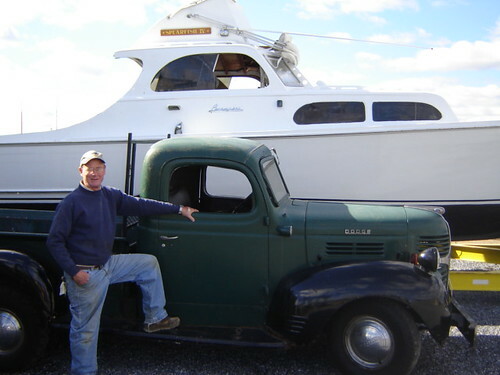 Bob assumes a Captain Morgan pose next to his 1946 or so Dodge pickup. 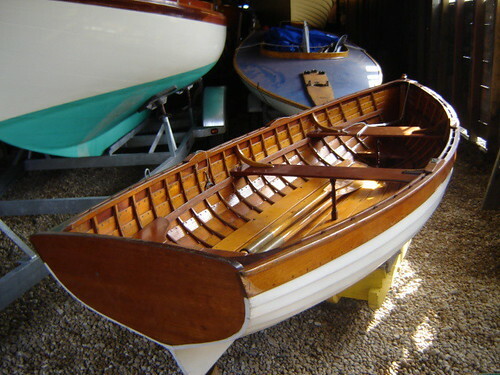 Finally here’s a photo of the Herreshoff Columbia model Dinghy that Tom Beaton and I built in the early 80’s. 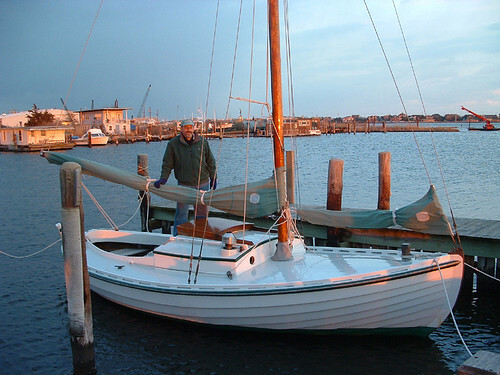 To the left is the Beaton built Flatfish Charlotte, just returned from a Summer of sailing in Brooklin, Maine. 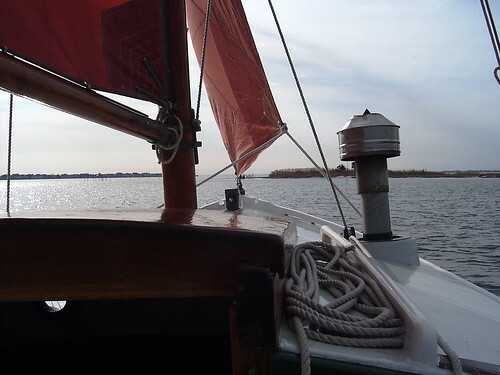 In the background is one of the Beaton Sneakboxes, once one of the hot racing classes on Barnegat Bay. They still race, though with reduced numbers. Author RussPosted on October 23, 2005 May 31, 2006 Categories SjoginLeave a comment on A successful fire today…. 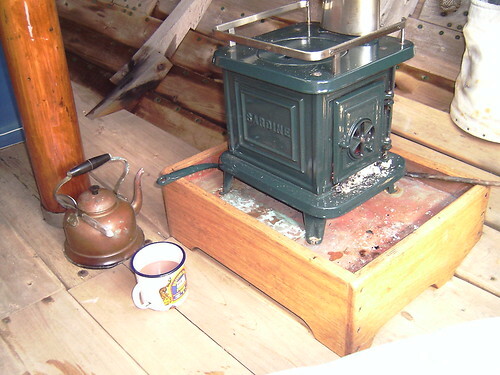 As mentioned yesterday, the Sardine woodstove (shown below), does not draw well (if at all) in a breeze when on a Starboard tack. 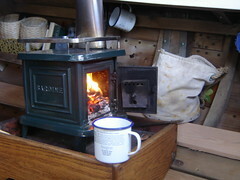 When she’s facing that way, a Northeast breeze like we have today, causes the stove to work in reverse. Sort of like trying to live in a food Smoker. No hot tea today. Well here we go again. My son Jeffrey has set me up with WordPress to host my pictures and comments. 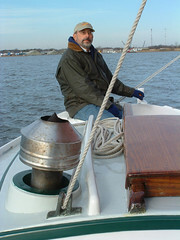 This was taken after being re-rigged in late September, ready for the off season. Here we are hove to off Swan Point in January 2004. Note the absence of smoke from the chimney. Most likely it is pouring into the cabin as we’re on Starboard tack! Need to try a different smokehead.